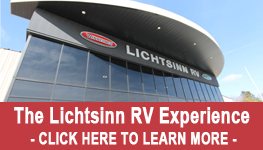 At Lichtsinn RV, we also have a strong commitment to excellence as evidenced by the hundreds of customers from across the world who choose to work with our dealership here in Forest City, Iowa -- only 1 mile away from the Winnebago Industries factory. For more information on the Winnebago View and Navion click here. See our Winnebago View and Navion inventory here.